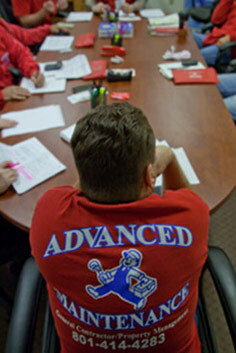 Advanced Maintenance has assembled an accomplished team to carry out its mission. Our team brings passion & expertise in developing the best practices in the maintenance field. We believe we have the most skilled craftsmen around. With every technician having years upon years of experience in various maintenance fields we are confident in their troubleshooting skills as well as their skill set period! From the CEO to the newest hire, you will get a knowledgeable & skilled technician every time we arrive at your door.